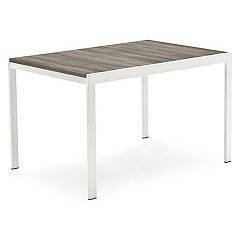 Table model AIRPORT ONE, the metal frame and glass top rectangular in shape. Extensible. The use of cutting-edge technology - patented telescopic extension mechanism - has allowed us to create a table with a unique, practical movement. In fact acting on the handles located on the short end and pulling it towards you, the extensions (in the same finish as the legs, as well as its structure) to come out from under the floor in succession and are positioned automatically. The legs remain at the corners on all 4 sides, thus avoiding annoying obstructions to the diners. Suitable to comfortably accommodate 6 to 8 people.